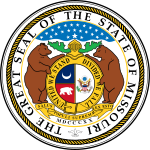 The 1996 United States presidential election in Missouri took place on November 5, 1996, as part of the 1996 United States presidential election. Voters chose 11 representatives, or electors to the Electoral College, who voted for president and vice president. Missouri was won by President Bill Clinton (D) over Senator Bob Dole (R-KS), with Clinton winning 47.54% to 41.24% by a margin of 6.3%. Billionaire businessman Ross Perot (Reform Party of the United States of America-TX) finished in third, with 10.06% of the popular vote. Since 1904, this state has been carried by the winner of the presidential election, with the exceptions of the elections of 1956, 2008, and 2012 (as of November 2016[update]). This election is the most recent in which Missouri voted for the Democrat as well as the last time that Hickory County, Benton County, Mercer County, Caldwell County, Grundy County, Crawford County, Carroll County, Franklin County, St. Clair County, Livingston County, DeKalb County, Lafayette County, St. Francois County, Daviess County, Bates County, Madison County, Montgomery County, Sullivan County, Clark County, Nodaway County, Henry County, Vernon County, Gentry County, Macon County, Knox County, Wayne County, Ripley County, Clinton County, Monroe County, Ralls County, Randolph County, Dunklin County, Reynolds County, Oregon County, Howard County, Shannon County, Shelby County, Callaway County, Scott County, Lincoln County, Audrain County, Pike County, Marion County, Lewis County, Scotland County, Schuyler County, Chariton County, Worth County, and Linn County voted for the Democratic candidate. This page was last edited on 20 December 2018, at 00:50 (UTC).